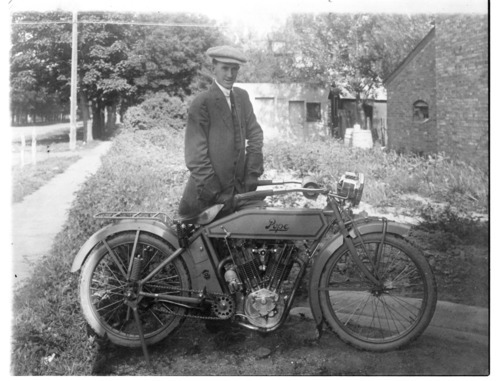 Phil Zimmerman poses with his Pope motorcycle in this photograph from 1912 or 1913. He lived in Lindsborg during those years, but the location of the photo was not recorded. At the time, Zimmerman was Secretary-Treasurer of the Kansas Short Grass Motorcycle Club and was very active in organizing and promoting the club's activities. The club enjoyed a measure of national prominence, largely because of several long-distance tours it sponsored into Colorado and Wyoming between 1910 and 1915. During Zimmerman's tenure as an officer, the club described itself as "the most famous motorcycle club in the world." Zimmerman was born in Kahoka, Missouri, in 1879, but his family moved to Rice County, Kansas, when he was a young boy. Starting in 1907 or 1908, he worked for the Hagstrom Brothers Manufacturing Company in Lindsborg, first as a salesman,and then in advertising and management. In the late 1910s, Zimmerman headed a statewide anti-Bolshevik league. Active in the Republican Party, Zimmerman supported Teddy Roosevelt's Progressive Party bid for president in 1912. He worked in a number of gubernatorial campaigns and was a state organizer for the National Republican League. In 1925, he was appointed Kansas Hotel Commissioner. Zimmerman moved to Topeka in 1925 and lived there the rest of his life. He was active in veterans' organizations and was associated with several causes. He founded the National Society of Long Fellows to advocate for the interests of tall men and was well-known for his horticultural projects, including a campaign to distribute packets of flower seeds to recipients throughout the world. Phil Zimmerman died in Topeka on December 8, 1965. Phil Zimmerman poses with his Pope motorcycle in this photograph from 1912 or 1913. He lived in Lindsborg during those years, but the location of the photo was not recorded. At the time, Zimmerman was Secretary-Treasurer of the Kansas Short Grass Motorcycle Club and was very active in organizing and promoting the club's activities. The club enjoyed a measure of national prominence, largely because of several long-distance tours it sponsored into Colorado and Wyoming between 1910 and 1915. During Zimmerman's tenure as an officer, the club described itself as "the most famous motorcycle club in the world." Zimmerman was born in Kahoka, Missouri, in 1879, but his family moved to Rice County, Kansas, when he was a young boy. Starting in 1907 or 1908, he worked for the Hagstrom Brothers Manufacturing Company in Lindsborg, first as a salesman,and then in advertising and management. In the late 1910s, Zimmerman headed a statewide anti-Bolshevik league. Active in the Republican Party, Zimmerman supported Teddy Roosevelt's Progressive Party bid for president in 1912. He worked in a number of gubernatorial campaigns and was a state organizer for the National Republican League. In 1925, he was appointed Kansas Hotel Commissioner. Zimmerman moved to Topeka in 1925 and lived there the rest of his life. He was active in veterans' organizations and was associated with several causes. He founded the National Society of Long Fellows to advocate for the interests of tall men and was well-known for his horticultural projects, including a campaign to distribute packets of flower seeds to recipients throughout the world. Phil Zimmerman died in Topeka on December 8, 1965.